Here’s the book cover! If you pass by a book store and see this, put it at the front of the display. The debut book by Fairfax columnist Andrew P Street (View from the Street), published October 2015. An irreverent take on the political life and times of the man who was our 28th prime minister. Poor people don’t drive cars. People have the right to be bigots. I’m a fixer. Team Australia. Shirtfonting. Choppergate. Stop the boats. Coal is good for humanity. No cuts to health. Sir Prince Philip. The flags. It’s all the fault of the febrile media. And that whole onion thing. 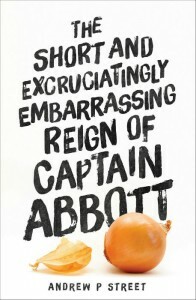 Andrew P Street details the litany of gaffes, goofs and questionable captain’s calls that characterised the subsequent reign of the Abbott government, following the trail from bold promises to questionable realities, unlikely recoveries to inexplicable own goals, Malcolm Turnbull’s assurances of support to the day he pushed the Captain off his bike once and for all. And all this comes with a colourful cast of supporting characters and dangerous loons that only a nation unfamiliar with the concept of below- the-line voting could elect. Here is a unique take on a modern politics Australian style. If Game of Thrones was a deeply irreverent book about politics, then the TV series would probably not rate nearly as well. It would, however, look something like this.